Theft or “acquisition without permission” can take several forms. We will begin by saying that actual OOG (Out-of-Game) theft will be handled severely. We will expel and prosecute, to the fullest extent possible, anyone who steals property from another player, from The Wyvern Group, or from the camp facilities or owner. The following rules apply to theft of in game items. Any in game item is eligible to be used/borrowed/stolen by another character. When in possession of someone else’s property, players are expected to take reasonable care in their use. It is, however, advisable to not bring delicate, or expensive props and materials to the game environment. If your character is planning on breaking into a private cabin, or otherwise using skills in such a manner that you want to remain anonymous, you should find a Marshall; which would be a Thieving Marshall, Game Director, or Staff Member. Surreptitious removal of small items from a person’s pocket or pouch requires use of the Pick Pocket skill. Never actually place your hand in someone’s pocket. This is a violation of personal space. A Character with the Pick Pocket skill will be issued a few tokens with their character number on them. This token is an out-of-game item and cannot be stolen or destroyed. To pick someone’s pocket, you must successfully insert your token into the targets pocket or pouch without being detected. If the act is successful you, or a Marshall, must approach the target and advise them that their pocket has just been picked. The target must hand over one random in game item from that location along with your token. If the pocket was empty or contained no game items, then nothing is given. Retrieval of the stolen item is an OOG (Out-of-Game) sequence. The target still does not know, in game, that they have been ripped off. It is a good idea to have a Marshall retrieve the item and token from the target. This will ensure that the item selection is fair and that your identity remains hidden. Only items of palm size or smaller may be taken. Pick Pocket is a continuous skill and may be used repeatedly. If you are successful in gaining entry to a building, public or private, you may have the opportunity or desire to acquire some of the contents for yourself. Any game items in the structure are eligible. Personal, OOG (Out-of-Game) items may not be touched, searched or moved. All such personal items should be stored under a bed, cot, or bunk. Only non-game items may be placed in this protected location. Things like mundane clothes, bath/toiletry items, etc. should be stored here, out of game play. Extra weapons, coins, armor, scrolls, etc. may not be placed under your bunk because they are in game items and not subject to the protection of the OOG (Out-of-Game) area. Items may also be protected by the “Rubbermaid® Rule.” This refers to the fact that many players like to use large plastic bins to transport their equipment. These do not always fit under beds and bunks. They must be labeled “OOG” and are subject to the same rules for under the bunk items. It is suggested that these bins be covered or decorated so as not to detract from the game atmosphere. Because there are personal items stored in cabins and sleeping areas, it is recommended that you locate a Game Director, Staff Member, or Thieving Marshall to accompany you on these missions. They will ensure all locks and traps are dealt with properly, and will witness that no OOG (Out-of-Game) items are disturbed. You must now deal with any items that you liberate from someone else. If the item is recognized or you are caught there could be heavy penalties to pay. If you are successful in managing your stolen bounty, it is yours to use as you will, but all items must be returned to the owner or to Logistics before the end of the event. You will be given Item Cards for any objects that you have obtained. Additionally, it is customary for the owner of a stolen item to loan it to the thief for use at future events. Traps can take various forms and have a variety of effects. A Marshall must inspect all traps for safety and assess for the intended effect. To set a trap that has an effect other than simply causing noise, you must have the skill Set Traps or the skill Woodland Trapping. The difference between these skills is only in the environment where they are used. Set Traps is for use in cabins or urban areas, while Woodland Trapping is for use in a forest environment only, and usually deals with various types of snares. To set a trap you must rig a trigger mechanism that will set off an alarm, or throw a flag, or some other indicator that the trap has been sprung. Also, determine what the intended effect will be. This could range from causing damage, to ensnaring a person, to releasing alchemical substances. The mechanism and effect are only limited by your imagination. Be sure you have all materials and components ready before you begin construction. When your trap is prepared, find a Marshall to inspect it for safety and determine effect and DEX cost. The Marshall will give you a TRAPPED! card to apply to the mechanism. The Marshall will write a brief description of the trap along with the effect and DEX cost on the card. All you need to do now is wait for the prey. Upon encountering a trap (if you’re lucky enough to notice it) you may attempt to disarm it if you have the skill Trapfinding. Persons without the Trapfinding skill may not disarm any trap that has been created with the Set Traps or the Woodland Trapping skill. Any trap, regardless of how large or intricate it is, may be disarmed, but only through the use of Trapfinding. Traps can only be disarmed before they are sprung. If you set off a trap, it is too late to attempt to disarm it. When a trap is sprung, locate the TRAPPED! card and take the described effect. A Marshall is required for any attempt to disarm a trap. Declare how many DEX points you wish to expend on the attempt. Locate the TRAPPED! card and compare your DEX effort to the amount used to create the trap. If your DEX equals or exceeds the amount for creation, the trap has been successfully disarmed. If your DEX expenditure is less than the creation cost, you have made a mistake and sprung the trap. Take the effect listed on the card. As you can see, disarming traps is a risky business. Characters may disarm any traps they have set themselves without the Trapfinding skill and at no DEX cost. Pollux is about to open a door, but he notices a string running from the inside of the latch to somewhere above the door frame. This is obviously some sort of trap. He role-plays disarming the trap for a few minutes. During this time he checks his character card to see that he has only 8 DEX points left. He decides to allocate them all for this attempt. He’s come too far to be stopped now! He crosses the DEX points off his card and the game director, who is accompanying him, then reaches inside for the TRAPPED! card. The card indicates that the trap was set with 10 DEX points and has the effect of causing the person who springs it to fall asleep for 10 minutes. Pollux’s luck has run out! He swings the door open, springing the trap and collapses in the doorway to snooze for a while. For reasons of safety, doors, chests, and other items are never actually locked or bolted shut. In-game locks that are built into an item such as those on a chest or in a door must be left open, but are assumed to be locked. Padlocks, on the other hand, will be closed on the latch, but the hasp must be left open. All locks must have phys-reps and keys. An extra key should be deposited at Logistics. 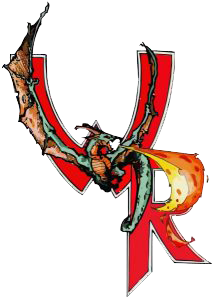 All locks in Wyvern Rising are assigned a rank of difficulty. Lock ranks are designated by numbers and correspond to the Pick Locks skill. Simple locks are typically rank 1-3. Padlocks will rarely be higher than rank 5. Large or intricate locks on doors or vaults can range higher, with no strict upper limit, but anything beyond rank 8 is exceptionally rare. To pick a lock, you must possess the Pick Locks skill and have a set of lock picking tools. All locks will have a small envelope attached that has information regarding the rank of the lock and any other special properties. You may not open the envelope until you have spent necessary role-playing time in your attempt to pick the lock. After opening the envelope, compare the rank of the lock to the amount of DEX expended in your picking attempt. If your input DEX equals or exceeds the rank of the lock, you are successful. Expend DEX points for the attempt on your character card as normal. Return the envelope, and you may continue on your way. If the lock rank is higher than your DEX expenditure your attempt has failed. Expend the DEX and replace the lock tag. The lock remains closed and you do not have the access you were seeking. There are cases when the effort to keep people out of where they don’t belong is far more insidious than a simple lock: a lock may contain a trap to prevent tampering. If this is the case, then picking the lock is only the first hurdle in obtaining the goods that are being protected. If you attempt to pick a lock, and open the envelope, you may well find a TRAPPED! envelope within the lock’s envelope. This may represent a pin that is set to spring if the lock’s tumblers are manipulated, or perhaps a small glass filament that releases a sleeping gas if the lock is opened without the appropriate key. Whatever the case, the TRAPPED! envelope will contain any details and effects, and will also tell you how many DEX points are necessary to avoid the menacing trap you may be about to spring. If you attempt to pick a lock and find a TRAPPED! envelope within, regardless of success or failure with regards to opening the lock, you must now deal with the trap. The basic procedure follows any other trap that may be encountered. First, assuming you have the Trapfinding skill, you must decide how many of your DEX points you will put into the effort of disarming this trap. The TRAPPED! envelope is then opened, and your DEX points are compared to the DEX points printed within. If your dedicated number is higher, you have succeeded. Spend the DEX on your card, and continue on. If your dedicated total is lower, spend the DEX, read on, and take whatever effects may be listed. Another unique way of gaining coin is through the Forgery skill . Forgeries of art work, documents, and even personal letters have the potential of earning vast amounts of money for those with skill and talent, but lacking in morals. Producing fake coin, although very difficult and extremely risky, has even been attempted. Be warned, however, that the penalties for deceit by false representation are universally harsh in all kingdoms of the world. The quality of a forgery is directly dependent upon the amount of DEX invested in its creation. A director may give a DEX bonus for exceptionally good role-playing of the forgery attempt or for a character’s unique familiarity with the item being copied. On the other hand, characters attempting to reveal a forgery with the Detect Forgery skill will have the same advantages for role-playing and familiarity.